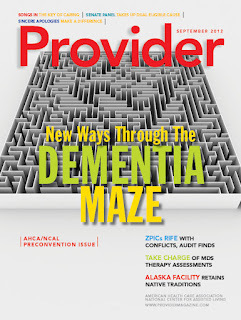 September’s Preconvention issue of Provider Magazine previews the three days’ worth of symposiums that will be presented at the 63rd Annual Convention & Expo of the American Health Care Association/ National Center for Assisted Living (AHCA/NCAL) in Tampa, Fla. from Oct. 7-10. On page 42, an in-depth look into all that “the gem of Florida’s west coast” has to offer allows readers to become better informed about Tampa’s highlights—the recent comeback of electric streetcars, the old-world vibe in the Cigar Capital of the World (better known as Ybor City), and the nationally acclaimed Lowry Park Zoo. Contributing Editor Kathleen Lourde’s cover story, “Bridging the Gap in Dementia Care” challenges modern methods associated with treating dementia on page 22. Lourde spoke with G. Allen Power, MD, who asserted that dementia patients are often denied patient-specific treatments. 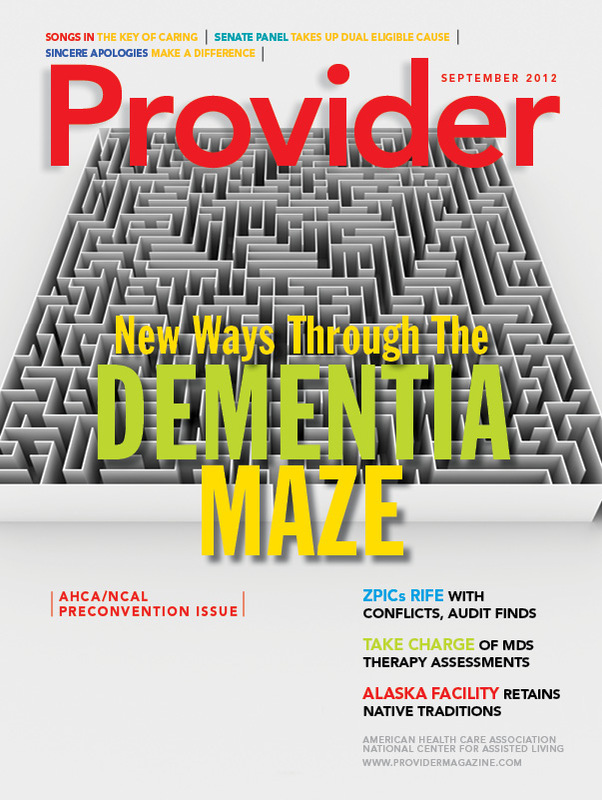 “‘The most important [message] is that we need to challenge the way we look at people with dementia,’ Power tells Provider. ‘We need to see the whole person, what their strengths are, and not just their disability.’” Lourde additionally breaks down what dementia patients’ “difficult behaviors” suggest, and presents strategies to confront said behaviors in order to attain better communication with patients. This month’s Caregiving section highlights an Alaskan nursing home that offers their residents familiar cultural experiences. Managers at the Denali Center in Fairbanks, Alaska invite native dancers, play traditional music, and screen documentaries in hopes of making their residents feel more at home. The article asserts that “the purpose of these cultural activities is to support residents in their transition to placement, nourish their bodies and souls, and to celebrate cultural wealth.” Flip to page 45 to learn more! Can honest apologies help to generate trust in risk management programs? David A. Jones delves into this topic and more in the Management section, on page 52. 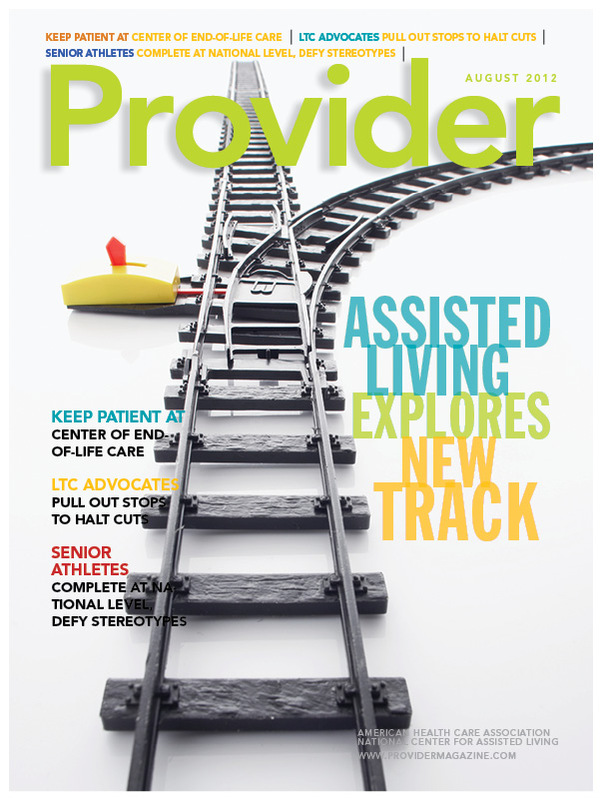 Pick up the September issue of Provider today, or visit our website to learn more about the latest news in long-term and post-acute care. 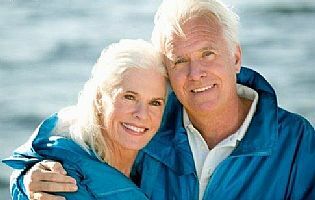 · Seniors and baby boomers expect their lives to improve as they grow older. · A significant minority of respondents feel less secure: about 1 in 4 report trouble with current monthly living expenses. · Perceptions of community services for older Americans differ--boomers are less confident than older respondents that their community will provide the services they need. Two-thirds of Americans aged 65 and older depend on Medicare. However, of the respondents aged 60 to 64, one in four are not confident that they will be able to afford the costs associated with Medicare (deductibles, premiums, and copays) in future years. Half of older Americans report having someone they consider to be a caregiver in their lives, and almost to one-third of seniors say that they themselves serve as a caregiver for someone else. Are you optimistic Medicare will be there when you need it? 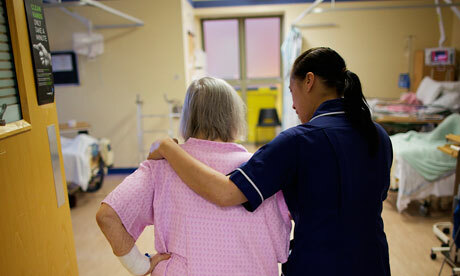 What are the biggest challenges facing the aging in this country today? Yesterday, AHCA/NCAL proudly announced the winners of the National Quality Award Program. Out of the total 458 skilled nursing facilities who won Bronze, Silver, or Gold, there were only two facilities who earned the prestigious Gold Award. Golden Living Center in Abbotsford, WI and Grand Islander Center of Genesis HealthCare in Middletown, RI are now in the company of only 11 other facilities who have earned the Gold award since the inception of the program in 1996. The AHCA/NCAL National Quality Award Program encourages long term care providers to strive towards performance excellence by providing three progressive step levels on the way to earning Gold. In order to obtain Gold in Excellence of Quality, applicants must exemplify superior performance over time based on leadership, strategic planning, customer focus, measurement, process management, and results. 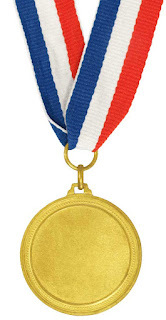 Gold recipients must first have received Silver and Bronze in previous years in order to show steady improvement and progress. To see the full list of all of this year’s recipients, click here. Rebecca Ann Wingo, employee of Schryver Medical, did not survive the tragic shooting that occurred at the Century 16th Movie Theatre in Aurora, CO on July 20th. 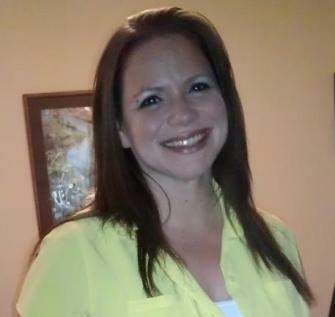 Rebecca was a single mother of two, and she will be greatly missed by her loved ones and coworkers. Mark Schryver of Schryver Medical expressed, "We are deepy saddened by the loss experienced by her friends within Schryver Medical and her family; especially her two young daughters. We want to thank each of you for your thoughts, prayers, and support through this national tragedy." Our thoughts and prayers remain with the families and loved ones of all of the victims of the tragedy. Recently, there have been growing concerns over the number of seniors who have been unexpectedly forced to pay thousands of dollars for nursing home care after a hospital stay. In light of these concerns, Medicare has decided to launch a pilot project that will test whether relaxing its hospital payment rules could alleviate financial stress on beneficiaries. Observation stays are on the rise and are considered outpatient service—tricky facts considering patients have to be inpatients for at least three days to qualify for Medicare’s follow-up care coverage in nursing homes. Many seniors in hospitals do not even know when they are in observation care, since hospitals are not legally required to do so. To add to the shock, observation patients are legally allowed to be billed high amounts on routine prescription medicines that are usually much less expensive. Currently, if Medicare decides that it has been billed by a hospital for inpatient treatment that should have been an observation stay, the facility can lose the entire payment. This causes many hospitals to put too many people in observation care. Under the new pilot, however, the 380 hospitals participating in the pilot project will be able to rebill Medicare for observation services if impatient care claims are denied. Medicare officials are also asking for feedback on possibly tightening the rules for observation care. This is all in attempt to ease the financial burden on patients and families. How do you feel about Medicare’s new pilot project? Have you had any personal experience with observation stays and Medicare billing? Barbara Baylis is this year’s recipient of the Mary K. Ousley Champion of Quality Award. She will be officially presented with the award at AHCA/NCAL’s Annual Convention & Expo on October 10 in Tampa, Florida. Each year, AHCA presents the Mary K. Ousley Champion of Quality Award to either an individual or organization that has strongly exemplified efforts to enhance quality performance in long term care as well as advocating for quality approaches. Furthermore, honorees have to also exhibit leadership in the implementation of quality improvement initiatives. Previously known as the Friend of Quality Award, the award was renamed in honor of Mary K. Ousley, a licensed nursing home administrator and nurse who has dedicated her life to quality improvement programs in long term care. Barbara has been a leader in the industry for championing quality care ever since 1992 when she introduced Continuous Quality Improvement to 200 nursing centers at Living Centers of America. Her areas of expertise include clinical practice, clinical and nursing administration policy and procedure, quality improvement and regulatory compliance. In addition to being Senior Vice President at Clinical and Residential Services at Kindred Healthcare, she currently serves as a member of the Quality Award Board of Overseers as well as the CMS Quality Assurance and Performance Improvement Technical Advisory Panel. "Thanks to Barbara's hard work and commitment to quality, our nursing and rehabilitation centers have shown improved patient outcomes, patient satisfaction, and have established a reputation for quality care," said Benjamin A. Breier, Kindred's President and Chief Operating Office, in a press release. Watch Barbara speak at Medline’s 2010 LTC Quality Summit here. Introducing This Year’s Silver Quality Award Winners! AHCA/NCAL is very proud to announce the 2012 recipients of the Silver – Achievement in Quality national quality award. This prestigious award serves to honor facilities nation-wide that demonstrate high levels of quality long term care and is part of the AHCA/NCAL National Quality Award Program. The AHCA/NCAL National Quality Award Program serves to help provide incentives for providers of long term care to strive towards even better quality and performance excellence. The program has three progressive step levels, and facilities must achieve an award at each level to progress to the next level. Recipients of the Silver Quality Award had to demonstrate an evolution in advancements-this includes advancements in quality, future plans, and sustainable organizational goals. You can check out this year’s Silver Quality Award recipients here. How do you think AHCA/NCAL’s National Quality Award Program has affected your facility? 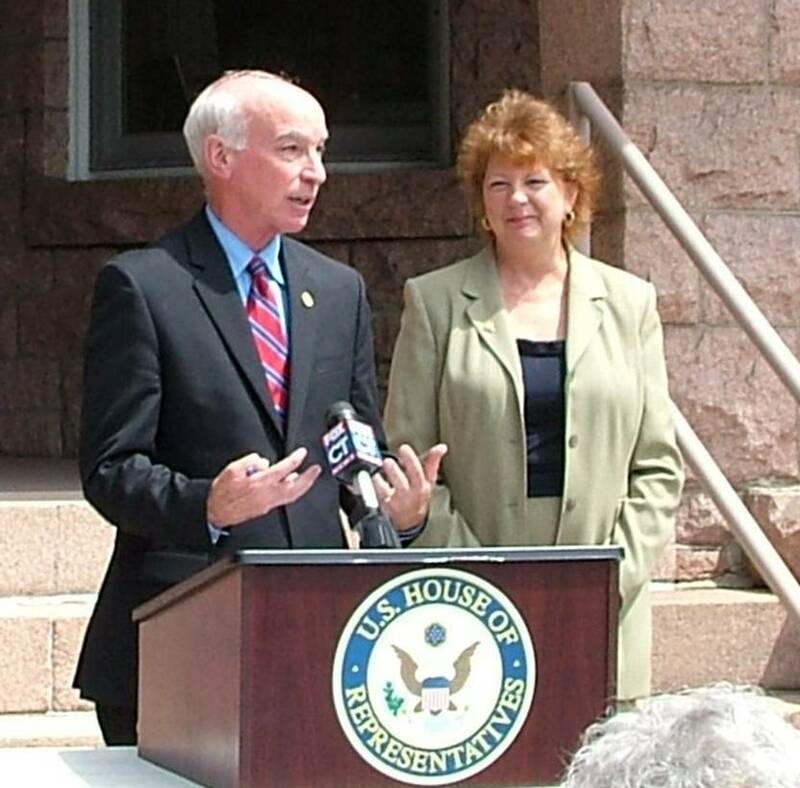 Yesterday, AHCA was proud to welcome Congressman Joe Courtney to Beechwood Rehabilitation and Nursing Center in New London, Connecticut. In addition to meeting with residents, Rep. Courtney also took the opportunity to talk about legislation that would allow observation stays to count towards the required three-day hospital stay needed to receive Medicare coverage for SNF care. Observation stays are getting a lot of notice lately in the media. The number of Medicare patients who enter the hospital for observation has risen 25% from 2007 to 2009 even though Medicare enrollment and hospital admissions have declined slightly. Courtney’s legislation, Improving Access to Medicare Coverage Act of 2011 (H.R. 1543/S. 818), is co-sponsored by Rep. Tom Latham (R-Iowa) and has bipartisan support, as does the Senate version introduced by Sens. John Kerry (D-Mass.) and Olympia Snowe (R-Maine). Have you or a loved one had any personal experience with observation stays and Medicare? Investments in direct-care staff are the focus of this month’s feature story, which highlights various innovative approaches providers are taking to improve staff satisfaction in compensation, opportunity, and support. Improvements in these areas have been shown to produce impressive results, such as higher retention rates and better quality of care. The lesson here: Organizations that make the most creative and unwavering investments in their direct-care staff are likely to see the best results. CCRCs are grappling with some sticky legal conundrums, and knowing what they are and what laws affect them are important first steps in reducing risk for these providers, according to attorney Andrew Bart, author of this month’s Legal Advisor column. The movement of residents from one level to another, and the separation of healthier residents from those with disabilities, are addressed in this informative article. Streamlining and tracking inventory are two key take-aways from this month’s Management column, which offers tips for food service managers on how to better track inventory and watch the bottom line at the same time. 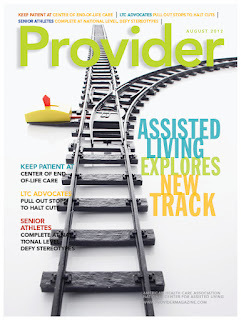 Pick up the latest issue today to find out the latest news and trends in long term and post-acute care. Read more from Provider here. At this year’s annual AHCA/NCAL Convention & Expo in Tampa, Florida, there will be over 70 education sessions offered covered on 13 learning tracks--giving attendees top CEU value. The majority of the education programs serve to help support the Quality Initiative as well as address other issues related to quality care for our residents and their families. Quality Initiative goals include reducing hospital readmissions, reducing the use of off-label anti-psychotic drugs, increasing customer satisfaction, and building a strong and stable workforce. Additionally, there will be useful sessions on reimbursement, risk management, advocacy, and building community. Case studies and best practices will be used to help illuminate the important issues and trends in our profession. View the full schedule of sessions available here. What better way is there to learn about long-term care issues than by conversing with peers and listening to the industry’s best minds?